Vietnamese woman Nguyen Thi Huong (C) takes a Tuoi Tre (Youth) newspaper journalist (R) to her husband's house in Dongshan Mountain in Zhangdun Town of China's Fujian Province. A Vietnamese woman marrying a Chinese via matchmaking only had a true wedding party and was recognized as a wife by her husband after she gave birth to a son for him. Even more, a Vietnamese wife in China had her identification papers kept by her husband’s family to prevent her fleeing home. Despite gender discrimination in families in China, tens of thousands of Vietnamese women, mostly coming from the Mekong Delta region, agree to set up families with Chinese men a year. Why? The answer definitely does not come from Chinese men themselves, but it is mainly driven by poverty and Vietnamese women’s desire to discover other parts of the world rather than being locked permanently in their hometown. On average, the family of a Vietnamese woman is paid roughly VND20 million (US$961) when she agrees to marry a foreign man, mainly Chinese and South Korean, via matchmaking. It is not a small sum in the context of the Mekong Delta in Vietnam, where most people are poor farmers. According to a report by the authorities of Fuzhou City in Fujian, a province in southeastern China, the city received 4,000 Vietnamese brides last year, most of whom came from Vinh Long, Can Tho, and Hau Giang in the delta. Flying to Fuzhou, the capital of Fujian, Tuoi Tre (Youth) newspaper journalists spent two more days and caught five buses to travel to Dongshan Mountain in Zhangdun Town of Nanping City to meet a Vietnamese wife. Her name is Nguyen Thi Huong and she is from Bac Lieu Province in the Mekong Delta. Bamboo forests cover the road to the mountain, where all is covered by snow in winter. Thanks to the recommendation of another Vietnamese wife, Tuoi Tre meeting Huong was a big surprise. She said she had never imagined receiving Vietnamese people in this out of the way remote area. Expressing her happiness at meeting Vietnamese, Huong showed off an important piece of news to Tuoi Tre that she had an old pig weighing over 100kg. Her husband’s family kept the pig a long time ago to save it for hosting a wedding party for her and her husband. “Have you been here for two years with your husband?” asked Tuoi Tre. The fact is that most Vietnamese women coming to Fujian are only presented in a wedding party after the women become pregnant or have sons. Then the couple will go to the authorities of Fuzhou to register their marriage. So during the period before registration, Vietnamese women have no legal status of marriage although they live with their husbands in China. 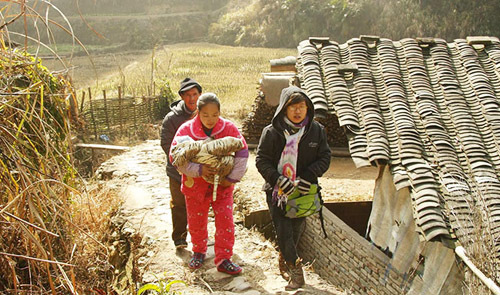 In Dongshan Mountain, many other families having Vietnamese wives are keeping pigs that are older than the pig on Huong’s farm. The story reminded Tuoi Tre journalists of the meetings with Chinese men in Shuiji Town of Nanping City during the first days of working in Fujian. A local bicycle repairman told Tuoi Tre, “It’s expensive to ‘buy’ Vietnamese wives. I spent 60,000 yuan renminbi [US$9,700] to have my wife now. “Husbands here fear that you may come here to take home their Vietnamese wives. The repairman admitted that he loves his wife very much and does not keep her passport but he is still wary enough to keep his marriage certificate and the birth certificates of his two sons. The only administrative agency in Fujian that Tuoi Tre could ask for information about the life and marriage situation of Vietnamese wives was the Office for Foreign Marriage Registration located on 44 Gudong Street in Gulou District of Fuzhou. Linwei, a staff member of the office, said the real number of Vietnamese wives in Fujian is more than 4,000 because they do not register and just come to China with travel visas. Zhangshuo, a journalist at a local newspaper, said no law office in Fuzhou has ever received a case to defend the rights of Vietnamese wives because they actually do not have enough knowledge and money to seek help from lawyers. The journalist said the wave of Vietnamese wives coming to Fujian started around five years ago, now totaling at around tens of thousands. However, they have no association or club to get together.